Fishing Dreams -- Ren'e Palmer sent this perfect picture to me in the 90's. This exquisite Norwegian Salmon fell to a spey rod and an early Godfrey Reel. Note the aluminum frame used on early reel; the solid drag design is working just fine . . . to this day! The first Godfrey Salmon and Steelhead Reels were introduced back in the early 1980's and featured great line control and power to handle Grande Cascapedia Salmon. The Drum Drag System in Godfrey Custom Reels is like that of Arthur Kovalovsky, the great salt water reel maker and patent holder. The drum is braked by a circular external brake pad or pads - the Kovalosky grand design. Originally, reels were of the standard aluminum frame type, but by 1999 it was time to improve the frame with addition of beautiful "wedding band" style nickel silver bands. Other modifications included nickel silver fitting throughout and inclusion of super hard aluminum bronze main bearings - last perhaps forever! This has been a long and uncompromising quest for design improvement yielding a full-function, elegant, and modern interpretation of the traditional Atlantic salmon reel with a rare sense of scale reminiscent of vom Hofe. With quick and easy photographic capability, new pocket phones have moved the catch and release fishing paradigm to catch, photograph, and release fishing. Very often the picture includes the rod and reel in the river! The Godfrey Custom Steelhead reels have been redesigned so that they are all-weather reliable and completely dunkable while retaining full function including no change to the smooth and dependable drag system -- regardless of how much water is sloshing around inside the reel! Getting rid of the bulk of the typical old-school hard rubber-delrin-ebonite-plastic sides and/or the heavy 1960's style aluminum block frame yields a sleek profiled, lighter weight Steelhead Reel. Add to this the powerful all-weather drag system and the design is complete. Note that there is no "o" rings and no seals of any kind, just a powerful, modern drag design for dependable all-weather fishing. 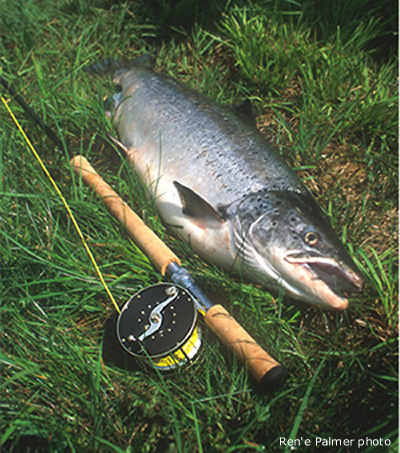 The Salmon Models: For over 30 years the Godfrey Salmon Reels have caught thousands of Atlantic salmon around the world. The Custom Salmon Reels are designed to provide more than adequate backing capacity, simply choose a Custom Reel to match your salmon rod line designation. The Steelhead Models: Rio Grande, Deschutes, and Babine have all the features of the Custom Salmon Reels, but are lighter and have direct retrieve. With out the gears they are designed with the all-weather drum drag system so work just fine when wet. All Godfrey Salmon & Steelhaed Reels are come with a traditional draw sting bag. Also included is the warranty and maintenance paper with recorded Reel Serial Number.